A really interesting statistic caught our eye recently. So interesting in fact, that we wanted to devote an entire blog to exploring it. You see, a recent study by Keepmoat Homes revealed that the average first time buyer is seven years older, and pays 30 times more for a house deposit than they did in 1960. To break it down into numbers, that means that first time buyers are now around 30 years old, and need to save approximately £20,000 to put down on their first home. Of course, the 1960’s was a completely different time. It was the era of rock and roll, bell bottom jeans and paisley everything. And it was a time when the average first time buyer was just 23 years old, and only needed £595.26 in their pocket to buy a house. But over the last 58 years, a poll of over 2000 UK adults showed that the buyer profile has changed dramatically. In 1960, the average first time buyer was 23 years old, likely married, with a household income of around £2,854. But the first-time buyer of 2018 is likely to be in their thirties and relying heavily on financial help from loved ones when they do manage to buy. While that might not sound right, it’s sadly true. Around 48% of today’s first-time buyers require some form of financial help to buy – around £10,200 on average per buyer. And most of this funding is coming from the Bank of Mum and Dad. Not only that, but the modern first-time buyer is much less likely to be married than their 1960’s counterpart, with only 30% even being in a relationship when they buy. Buying a house has undoubtedly become much harder in the last two decades, with house prices rising by more than £55,000 since 2000, and the average deposit going from £12,988 in 2000 to £20,622 today, and many buyers requiring much more depending on location. If we take a close look at the data – only 26% of first time buyers needed financial help to put together a deposit even as recently as 1990, which indicates that the challenges have really begun since the turn of the millennium. The average percentage of household income needed for a deposit has also increased, from just over a quarter of their annual household income, to more than half. The average property purchase price was also much more modest in the ‘90s, with first-time buyers likely to pay around £78,225 for a starter home off a deposit of only £5,210. It still took buyers in this decade four years to save for a deposit, but that compares pretty favourably to the five years and one month it takes average first-time buyers today. In the decades that followed the average age of first-time buyers, the size of deposit required, the average purchase price, the need for financial help and the time required to save for a deposit all increased, reaching a peak from 2011 onwards. Household income might be higher now, but so too are average house prices and deposits, which means nearly half of buyers now need financial help to buy. But this information doesn’t exist in a vacuum. In fact, it’s served to highlight just how much our society has changed since the 1960’s. While one in five first time buyers now are single, only 3% of first time buyers were single in the swinging sixties. By the 1970’s, the number of first time buyers who were married had dropped by 10%, and over the next decade dropped to 43% with the rise of the self-starting culture. By the 1990’s, married people represented 29% of first time buyers. As of today, only 27% of first time buyers are married, with a further 30% in a long-term relationship, and 43% single. Another interesting thing came out of the research – one that Keepmoat Homes weren’t expecting. In the study, it turned out that 31% of people were still living in the first home they bought. One in 10 bought their homes in the 1960’s, and 15% bought theirs in the 1980’s, and still live in the same property. This indicates that first-time buyers were looking for a long-term home. This is a pretty big contrast to now, when first time buyers will often opt for a smaller house or flat, and then upgrade when they start a family or need more space. For many first-time buyers, it can sometimes feel like getting a foot onto the property ladder is nigh on impossible. But there are signs that it’s improving, if you know what to look for. According to research carried out by UK Finance, the proportion of first-time buyers reached its highest level for a decade in 2017. 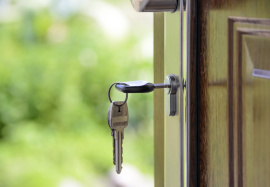 There was also the recent abolition of stamp duty for most first-time buyers, and the government are launching various schemes to help young people onto the ladder, including Help to Buy and Shared Ownership. So, while people under 30 who are buying their first home are the exception rather than the norm right now, it is starting to look up! If you would like advice on how to buy your first property, or help finding your long-term home, we’d love to help. Just get in touch with the team at Northwood today.